A Wide Line: Quinn’s Weekend Adventures: POP! Quinn’s first birthday is coming up, so I’m having tons of fun planning a small party for him. However, I’m having trouble figuring out what to put in the loot bags for the kids since there will be boys and girls ranging three months to eight years of age, so it’s hard to find goodies that are suitable for everyone. Then I remembered how much Quinn liked the “touchable” bubbles from the Gymboree class we went to a couple times. (The bubbles were the only thing either of us liked, so we didn’t go back.) The bubbles would land on the floor and on the kids’ hair and clothes, and they wouldn’t pop. They were a hit! I decided the Gymboree bubble solution would be perfect for the kiddies’ loot bags, and I looked up the recipe online. I had this big, grand plan to cook it up myself and create my own labels for the bubble bottles to go along with the party theme (more on that later). This all sounded so easy in my head. Then after further consideration, I decided that sounded like a sh*t-load of work. At a party supply store, I stumbled upon “Super Miracle Bubbles,” which claim to be the exact same thing. I purchased a small bottle to test out at home with Quinn. 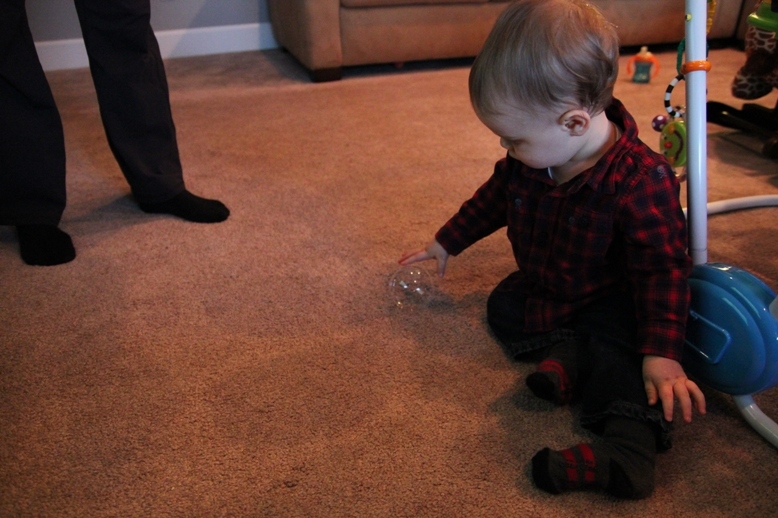 At first, Quinn got a little frustrated that he couldn't pick them up. 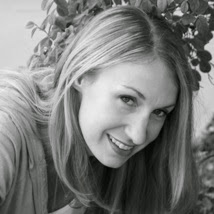 So I made a big production and exclaimed “Yay, Quinn! You popped it!” so he would know that’s what’s supposed to happen. 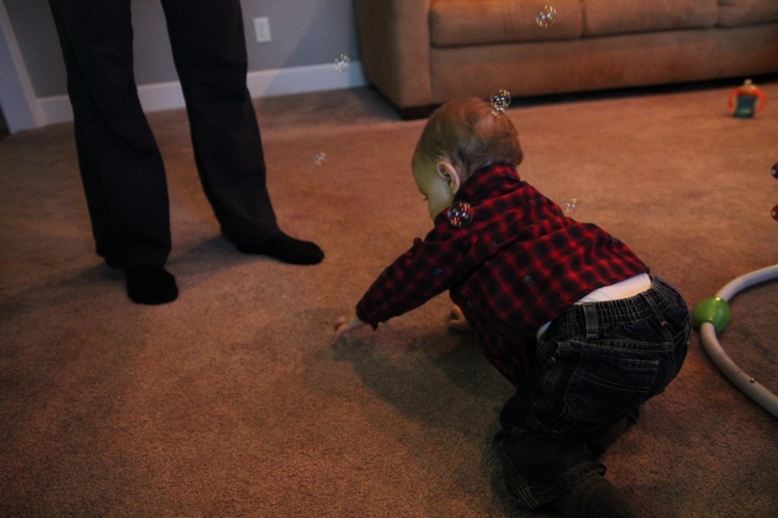 Then he really started to enjoy chasing the bubbles around the floor and popping them. 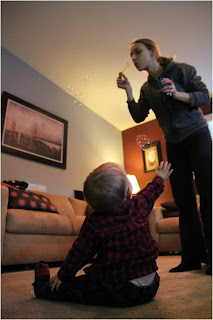 While I don’t think there’s anything “super” or “miracle” about these bubbles, they’re cheaper than the Gymboree version and easier than making them myself, which probably wouldn’t turn out as good as Gymboree's anyway. I might still make my own bottle labels though. I’m a glutton for punishment. Melissa you brought me back to my own first birthday party insanity with our first born!! I remember I went to 4 or 5 stores and spent way to much money! I ended up going to a very fancy toy store and they wrapped up everything beautifully, all for babies who were just a year or younger!! Looking back I see how silly it was, but it was such a fun and joyous time! There is something so special about the first birthday! Each of my children's first was a great day!! Have fun! I think the bubbles sound great, at that age they have such a short attention span it really doesn't matter!! Enjoy!! Thanks, Kathy! My goal is to look like I went through a lot of trouble to put on this party without actually going through a lot of trouble. :) It's so easy to go over the top. Too much cute stuff! Sometimes, I wish I could have put my kids on freeze. There are just times and ages where you wish they never grow up. But alas, time is not our friend. I know what you mean! Every milestone he reaches is bittersweet for me. I'm so happy and proud, yet each one is a leap farther away from being my baby boy. So glad you came by! Oh, I love when people use bubbles at weddings. Way less messy than rice, and there's just something whimsical about them. Oh the joy of bubbles!! My kids still love them!! !